So, after adding fallowing line in to my .emacs file I see no result, whether I'm running emacs in the X window or an terminal. ;; Init file should contain only one such instances. I been trying this pretty long time ago and I still see no explanation to where I could make an error in this short line ('(tooltip-mode nil)). The emacs debug shows no errors, every thing else runs well in my .emacs file and that tool-tip is turning me mad covering the top of my small laptop screen. 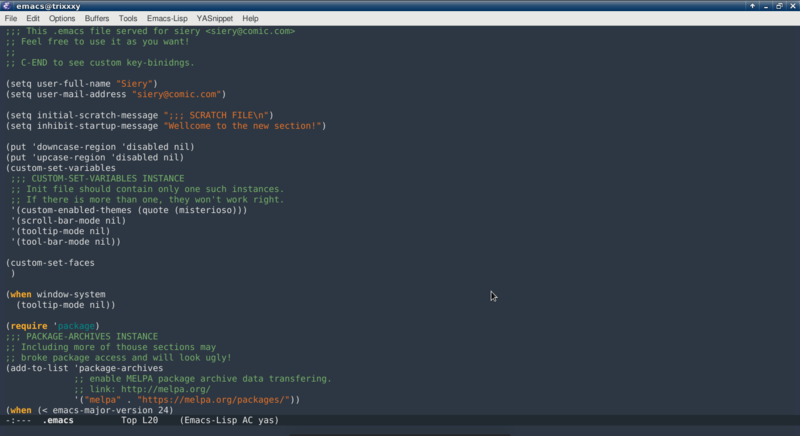 If that helps, I'm running Emacs 24.5.1 on Debian 9. Maintaining custom-set-variables by hand in your init file can be tricky. As the comment in your lisp snippet says there may only be one custom-set-variables for an emacs session. It may be that the custom-set-variables form is already in some other file like ~/.emacs.d/custom.el and not in ~/.emacs. You can determine where your customization information is by the function custom-file, e.g., use M-: (custom-file) RET and you can set that file name by setting the value of the variable custom-file. But that is also tricky. Consult the help of the variable custom-file via C-h v custom-file (I cite that help for convenience below). I suggest that you set tooltip-mode only over the custom interface or delete the customization of tooltip-mode (over the customization interface) and use the command (tooltip-mode -1) in your init file. File used for storing customization information. The default is nil, which means to use your init file as specified by user-init-file. If the value is not nil, it should be an absolute file name. Note that both lines are necessary: the first line tells Custom to save all customizations in this file, but does not load it. When you change this variable outside Custom, look in the previous custom file (usually your init file) for the forms (custom-set-variables ...) and (custom-set-faces ...), and copy them (whichever ones you find) to the new custom file. This will preserve your existing customizations. If you save this option using Custom, Custom will write all currently saved customizations, including the new one for this option itself, into the file you specify, overwriting any custom-set-variables and custom-set-faces forms already present in that file. It will not delete any customizations from the old custom file. You should do that manually if that is what you want. You also have to put something like (load "CUSTOM-FILE") in your init file, where CUSTOM-FILE is the actual name of the file. Otherwise, Emacs will not load the file when it starts up, and hence will not set custom-file to that file either. Not the answer you're looking for? Browse other questions tagged customize tooltip or ask your own question. how to not save duplicate information in Customize? How to make tooltip background transparent?